I'm floating on air and absolutely thrilled to announce that my quilt "Virginia is for Lovers" is in the final round of voting for the Alliance for American Quilts contest. A huge thank you to everyone who voted for me in the first round. The voting is now down to 4 quilts and ballots went out Friday a.m. to Alliance members and voting end Monday night. It would be such an honor to win and the grand prize of a Handi Quilter quilting machine would be absolutely amazing. So I'm again asking Alliance members to please vote for my quilt. 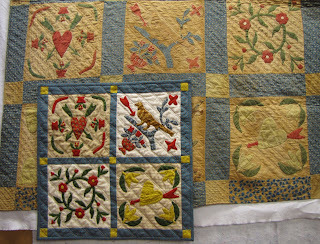 And if you are new to my blog please scroll down and read all about the making of this quilt and its antique inspiration. Off to float some more - WOO HOO. ﻿ The voting for the 2011 Alliance for American Quilts is now open -- through April 20th. My entry is quilt #117, Virginia is for Lovers. 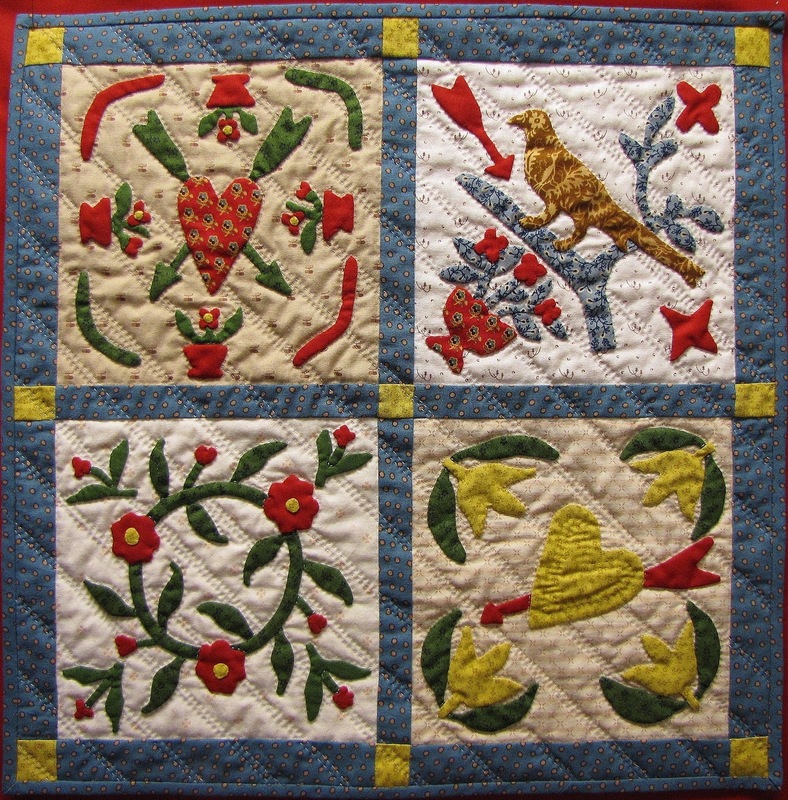 It is hand appliqued and hand quilted and based on a circa 1845 crib quilt in my collection (see below). I would love to win the Handi Quilter quilting machine and hope that you will consider voting for me. 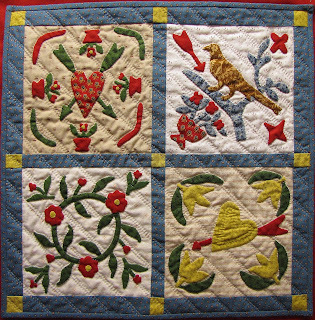 You must be a member to vote but it is not too late to join the Alliance; an excellent organization that does so much to preserve the history of American Quilts. I especially enjoy the Quilt Index. If you join by April 19th, Amy will email you a ballot. You can join on the Alliance website and pay by credit card or paypal, it is only $25.00 (tax deductible) and again it goes to a great group. 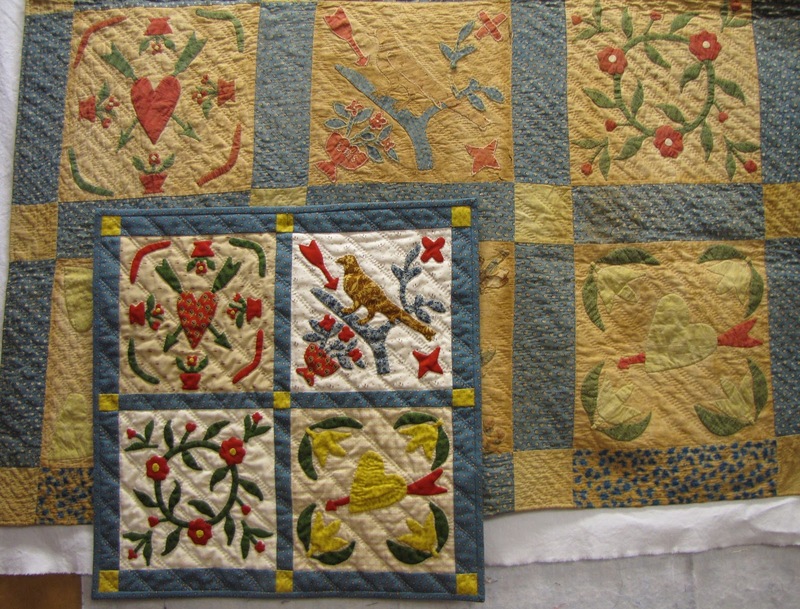 I thought you might like to see my challenge quilt along with the antique inspiration, a circa 1845 crib quilt from the Shenandoah valley of Virginia. Thanks for visiting and for considering my quilt.